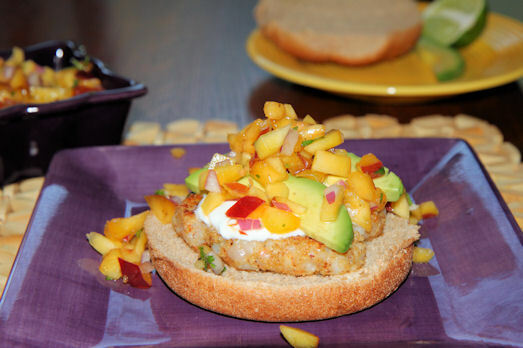 Recently, Pinterest has inspired a lot of my cooking experiments including this dinner over the weekend: Shrimp Burgers with Peachy Salsa from HowSweetTreats. I hardly ever cook with raw meat so this was out of my comfort zone. I have to admit – chopping up the shrimp meat in a food processor had me a little skeptical about these things. But after adding in the mustard, spices and breadcrumbs – HOLY YUM! Totally worth the mess. Seafood Perfection. When it comes to burgers, go big or go home. 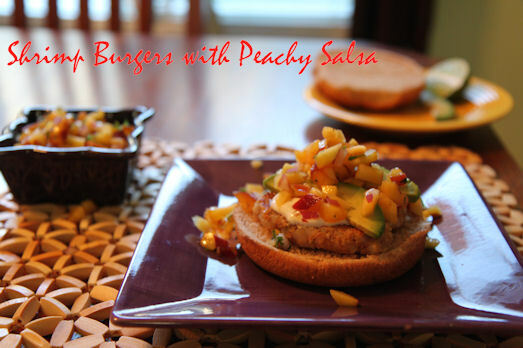 I topped the patties with Lily Light Sour Cream (15 calories per Tablespoon) mixed with lime juice and pepper. Sliced Avocado. Homemade Peach Salsa. And Whole Wheat buns. The Perfect Mid-Summer Meal. In a food processor, pulse the shrimp until chopped. Transfer to a medium bowl and combine with bread crumbs, egg, garlic, mustard, salt, pepper, paprika, onion powder and basil. Divide into six handfuls and shape into flattened round patties. Heat a skillet over medium heat with 1 Tbs of olive oil. Cook the patties for about 4-5 minutes on each side (they will be more pink and crispy). Mix your sour cream with the juice of one lime and a dash of salt and pepper. Use as a condiment over the patties.